If you receive an error message when calling our toll free number, please call our direct line at +1.412.793.4158. This error is caused by some telephone carriers not routing international phone calls to toll free phone numbers in the USA. and will never rust, rot, corrode or degrade. Industrial grade polypropylene plastic, it will never fade, dry out, crack or peel over time and is completely impervious to water. Highest grade MDF hardboard. The most economical pegboard we have ever made. shovels, brooms, rakes and more. Give your old peg board a face lift. Retail Display and Tool Storage. Heavy Duty Peg Hooks crafted from welded galvanized steel rod. Versatile PegBoard shelving in a variety of sizes and colors. Thousands of uses. Heavy duty baskets constructed from welded steel. Our patented Tiger Claw™ Pegboard Adapter allows waterfalls for slatwall to work with pegboard. With our patented Tiger Claw™ PegBoard Adapter, your pegboard can work with slatwall faceouts. We have organizers to hold work tools, saw blades, wrenches, screws, nuts and just about anything else. Heavy Duty PegBoard Bin for holding, storing and organizing. Easily removable and repositionable. Head rotates 180° for hanging guitars straight or at an angle. We offer a variety of fasteners for strong and easy installation of our product lines into most substrates. The proven T-Channel design allows free horizontal movement of hooks and accessories. Great for getting clutter off the floor and hanging longer items. They work just like traditional slatwall but measuring only 6" high, they fit just about anywhere. An interlocking all-aluminum slatwall system for storage, organization and display. Upgrade your slatwall to a MX™ appearance with our MX Channel Strip Kit. A beautiful and functional display system perfect for tradeshows and retail merchandising. Perfect for retail stores, trade shows, display areas, and more. Assembly required. Constructed from heavy gauge welded steel - fits all standard slatwall. Look no further - you can find all the organizers you need to hold just about anything on your SlatWall. Perfect for display areas, retail stores, workshops, garages, offices, factories, and more. Perfect for merchandising in retail stores. Also works great as shelving brackets. Perfect for merchandising in retail stores. Heavy duty baskets constructed from heavy gauge welded steel - fits all standard slatwall. For holding, storing and organizing. Easily removable and repositionable. From wall anchors, screws and adhesive. The next generation grid display. Built with heavy duty welded steel construction. Each unit is engineered to assemble or knock down in less than 5 minutes. The rigid welded grid design fits a multitude of organizers for hanging just about everything you have. Heavy duty SlatGrid Hooks constructed from welded steel. The beautiful metal surface attracts any magnet. No sharp pins and tacks to get pricked by so it’s great for kid’s rooms. The next generation magnetic display. The beautiful metal surface attracts any magnet. We offer high strength Neodymium magnets that are some of the most powerful type of permanent magnets in the world. We offer wet-erase markers that work on all of our MagPanel systems. Modern, sleek and custom-fitted to your wall space and beautiful enough for aesthetic spaces, and yet strong enough for heavy duty use. A wall-mount shelf featuring heavy-duty all metal construction with integral wall brackets and a stunning appearance. 8 ft tall shelving rack with huge 44"x20" shelves. A rugged TV stand made for indoor and outdoor environments. Perfect for factories, workshops, garages, display areas, retail stores and more. Featuring heavy duty solid metal construction. Pre-formed inside and outside corners eliminate miter cutting. Featuring heavy duty solid metal construction for ultimate durability. Provides a professional solution to a nagging problem. Pre-formed inside and outside corners eliminate miter cuts making installation even easier. Get your Aluminum Diamond Plate here - any size you need up to 4'x10' sheets. Perfect to use as a heavy duty flooring surface over existing cement or mezzanine structures in factories, freezers and more. This is real commercial grade metal. Diamond Plate is also known around the world as tread plate, checker plate and floor plate. This is real commercial grade Aluminum Diamond Plate 3003H22 - not the imitation stamped metal that others use. A beautifully sleek appearance with virtually no reflection and is widely used in sign manufacturing. A beautifully sleek appearance that is much tougher than paint. Anodized finish eliminates finger prints and stains. Our colored aluminum offers extreme durability in outdoor exposure as well as indoors because of our high-quality paint system. This is real commercial grade aluminum 3003H14. Brushed finish. Easy to cut, drill, form, etc. A beautifully sleek appearance with nice brush marks. Clear anodized finish eliminates finger prints and stains. This is the same real commercial grade stainless steel like you see on high end kitchen appliances and machinery. The world's best parking guide is now even better. Now available in 4 larger sizes and with 2 mounting options to choose from. A vehicle door protector for your garage. Stop worrying about BANGing your vehicle door against a nearby garage post. A vehicle door protector for your garage. Stop worrying about BANGing your vehicle door against a nearby garage walls. Eliminate impact damage with our thick laminate system that cushions even the most severe blows. Custom made solid metal kick plates to protect doors from marring or damage from foot traffic. Take your merchandisers to the next level by adding our decorative Channel Strips. is one of the most powerful choices a consumer can make. for performance, style, as well as sustainability to our planet. 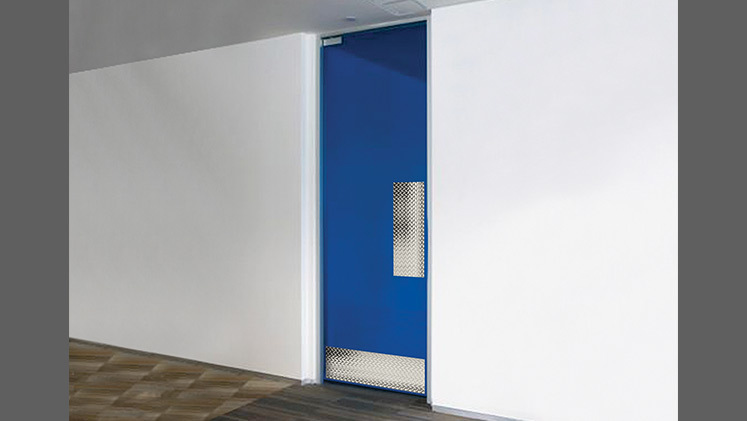 Protect your doors with our PushPlate MX™ - custom made solid metal push plates to protect doors from marring or damage from hand traffic. Crafted for Commercial Grade use, our PushPlate MX™ is built tough and is remarkably simple to install – just peel & stick. Several size choices to accommodate different types of doors. Several metal choices are available to suit your aesthetic requirement. PushPlate MX™ comes standard with our Self-Adhering feature or alternatively via screw mount.